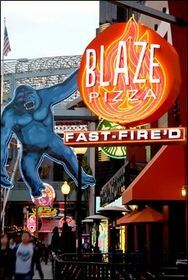 LOS ANGELES, CA--(Marketwired - Mar 1, 2016) - Blaze Fast Fire'd Pizza, the fast-casual artisanal pizza concept known for its chef-driven menu and casually hip restaurants, announced today that it will open a new Los Angeles area location at the iconic Universal CityWalk, located adjacent to Universal Studios Hollywood, on Thursday, March 3rd. To celebrate the grand opening, Blaze Pizza will offer FREE build-your-own artisanal pizzas on Friday, March 4th from 11:00 a.m. to 11:00 p.m. to anyone who follows Blaze Pizza on Instagram, Twitter, or Facebook. The highly anticipated restaurant is centrally located next to CityWalk's popular "5 Towers" concert stage. Blaze Pizza is a modern day "pizza joint" serving up artisanal pizzas that are both fast and affordable. Since its first restaurant debuted in 2012, Blaze has quickly become one of the nation's hottest restaurant concepts, with fans lining up each day for the custom-built pizzas, freshly made salads, blood orange lemonade and s'more pies. Each restaurant features an interactive open-kitchen format that allows guests to customize one of the menu's signature pizzas or create their own, choosing from a wide selection of fresh, artisanal ingredients -- all for about $8. The generously-sized personal pizzas are then sent to a blazing hot open-flame oven -- the centerpiece of the restaurant -- where dedicated pizzasmiths ensure that the thin-crust pies are fast-fire'd and ready to eat in just 180 seconds. Restaurants make their own dough from scratch using a recipe developed by critically-acclaimed Executive Chef Bradford Kent (the "Pizza Whisperer"), which requires a 24-hour fermentation period to produce his signature light-as-air, crisp crust. For pizza fans with specific dietary needs, Blaze Pizza offers gluten-free dough and vegan cheese. The CityWalk restaurant will also feature a selection of wine and draft beer. 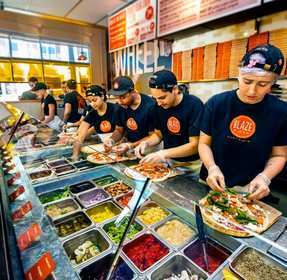 "Our mission at Blaze is really simple -- we're taking pizza back to its roots," said Jim Mizes, president & COO of Blaze Pizza. "By making dough in-house, carefully sourcing ingredients, and cooking by fire, we're giving guests a great way to enjoy artisanal pizza without the wait. It's changing the way people think about and eat pizza." Blaze Pizza is driven by a commitment to 'Intelligent Choices for our Pizzas, People & Planet' and a belief that guests deserve a better way to enjoy fast food. The company maintains a "keep it simple" philosophy that shuns rapid-fire new product introductions and limited time offers, and instead focuses on carefully sourcing high-quality ingredients, making its dough from scratch and cooking its fast-fire'd pizzas to order, to the delight of its food-centric fan base. Recently the company announced that it has successfully leveraged its growing size and category leadership to "raise the bar" in its ingredient sourcing, advancing its commitment to serve food that is free of artificial colors, flavors, preservatives and fillers. With the recent removal of nitrites from its pepperoni, salame, ham and bacon, Blaze Pizza's 'journey to clean' is nearly complete. Soon, the company plans to upgrade a short list of remaining items -- olives, garlic, salad dressings and blood orange lemonade - in a move to ensure that all ingredients for its pizzas and salads are additive-free. Universal CityWalk is Southern California's dynamic entertainment, dining and shopping destination that reflects the area's rich cultural diversity. The iconic open-air leisure and nightlife complex provides "Always Unexpected" entertainment options and has served as a prototype for similar destinations. Universal CityWalk includes the high-tech concert venue, "5 Towers," L.A.'s best movie-going experience at the Universal Cinemas and unique venues such as Samba Brazilian Steakhouse, Infusion Lounge, iFly indoor skydiving and mechanical bull-riding at Saddle Ranch Chop House. The first Blaze Pizza® restaurant opened on Aug. 6, 2012, in Irvine, Calif., and quickly gained attention for its chef-driven recipes, thoughtful interior design, and a service culture that celebrates individuality. Now ranked as the overall #2 fast-casual brand in FastCasual.com's annual Top 100 list, Blaze Pizza is building momentum and developing a cult-like following as it expands across the country. The company currently operates 112 restaurants in 27 states and Canada, including the major metropolitan areas of Los Angeles, New York, Chicago, San Francisco, Toronto, Las Vegas, Dallas and Washington D.C. Founded by Elise and Rick Wetzel (co-founder of Wetzel's Pretzels), the concept is backed by investors including LeBron James, Maria Shriver, Patrick Schwarzenegger, Boston Red Sox co-owner Tom Werner and movie producer John Davis. For more information, please visit blazepizza.com and facebook.com/blazepizza or click here to view a company video.